A lazy brunch is such a tonic when you're on holiday. 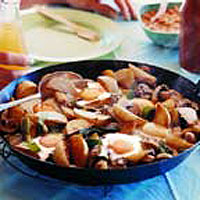 This recipe, comprising spicy potato wedges with mushrooms, anchovies and eggs, will satisfy hungry outdoor appetites. All you need is a large, lidded frying pan, preferably with a non-stick lining. For an easy vegetarian option, simply prepare the hash without adding the anchovies. Heat 3 tablespoons of the oil in a large frying pan. Add the spicy potato wedges and fry gently for about 10 minutes, turning frequently until they are a pale golden colour. Remove from the pan and set aside. Add the remaining oil to the pan with the sliced salad onions and fry gently for 2 minutes. Add the mushrooms and fry them quickly, stirring for 5 minutes or until any moisture has evaporated. Stir in the chopped anchovies. Return the potatoes to the pan and carefully fold all the ingredients together until evenly combined. Gently break the eggs over the surface, keeping them slightly apart. Reduce the heat to its lowest setting and cover the pan with a lid. Cook for 10-15 minutes until the eggs are just set. Serve immediately, using a fish slice to transfer the hash to serving plates. Serve hot baked beans on the side.